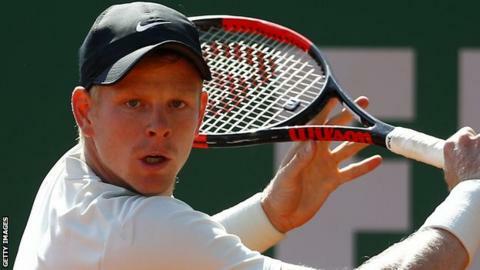 British number one Kyle Edmund was beaten by Italian qualifier Andreas Seppi in the first round of the Monte Carlo Masters in Monaco. Edmund, who reached his maiden ATP Tour final on Sunday, was beaten 6-3 5-7 6-2 by the world number 62. The Briton struggled on a slow surface, converting just two of his 11 break points as he lost in two hours three minutes. Seppi will play Spain's Guillermo Garcia-Lopez in the second round. Both players saved break points in their opening service games before Seppi won four consecutive games to put Edmund under pressure. Edmund, ranked a career-high 23rd in the world, improved with his forehand but Seppi served out the first set in 33 minutes. The Briton looked more comfortable in the second set but he failed to capitalise on any break points, eventually forcing a decider as Seppi hit a backhand into the net. Edmund held off three break points in the opening game of the third set, but the Italian won the next three matches to set himself up for victory. Elsewhere, Austrian fifth seed Dominic Thiem fought back to beat Russia's Andrey Rublev 5-7 7-5 7-5. Thiem, making his return after a five-week absence with an ankle injury, saved a match point in the second set before reaching the third round in two hours 40 minutes. Bulgarian fourth seed Grigor Dimitrov also overcame a scare to beat France's Pierre-Hugues Herbert 3-6 6-2 6-4.